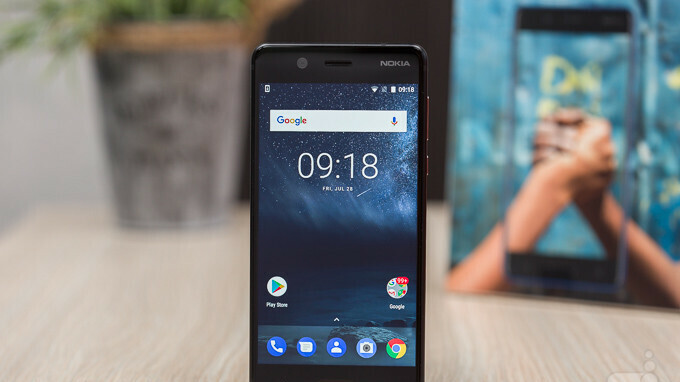 HMD Global plans on finishing up the dissemination of Android 9 Pie to its Nokia handsets before the first half of 2019 comes to an end. The Nokia licensee passed along its road map to Android Authority. First up to receive the latest Android build will be the Nokia 5 and Nokia 3.1 Plus. The former was released in June 2017 while the latter is only three months old. Android 9 Pie is expected to hit both devices by the end of this week. The Nokia 6 might be two years old, but the handset is penciled in for its Android 9 Pie update in a week or two. HMD's Chief Product Officer, Juho Sarvikas, says that the company is almost done with the Dolby Atmos surround-sound feature that will be added to the phone with the update. The last two Nokia models receiving Android 9 Pie will be the Nokia 1 and Nokia 3. This should take place in the beginning of the second quarter of 2019. Other unnamed Nokia phones should be updated before the latter two models receive the new files. HMD Global manufacturers most of its Nokia handsets under the Android One branding. As a result, it promises that these models will receive two years of Android updates and three years of security updates. This is good to hear that Nokia is finally getting Pie out for their phones although I think they should be a little faster on the rollout because Pie is already pushing half a year old. That's just an excuse. Essential already had their phone updated to Pie in the first month. A solid record is subjective and Nokia has issues with their updates as well. Dude, 4 Nokia Models got Pie update by end of Oct'18. these are low end phones barring 8 series. Besides, Essential has only one model to concentrate on. Exactly. People don’t seem to understand that only having one model means much less work to do with updates than if you have several models to concentrate on. They feel it’s an “excuse”, when it isn’t. The whole one phone only is just pure deflecting. Stop trying to use that as an excuse. That's not deflection. It's a fact. Simply because you believe it's deflection doesn't make it so. Facts don't work like that. Absolutely agree. For the size that HMD, they've done a commendable job at updating their fleet of smartphones, and their record is solid, despite what some may say. And they've done it with less issues than most, including Essential, that has only one smartphone to worry about but Pie was still released with more issues than HMD. Right, because the Nokia phones that have been updated to Pie didn't have any issues. That's your excuse every time. I think it's time for you to change your tune. Post the link to where I said or implied that HMD has never had issues with updates. Try and comprehend what I type instead of attacking me because you didn't take the time out to understand what I typed. Stop getting so defensive then. The way you toss that out as a response each time just shows that you were trying to imply it. Stop deflecting from what I asked and provide the link. I implied nothing, and you assumed everything. HMD has a solid record with updates, and pushes them out faster and better than most, with fewer issues after the updates than even Google, of which Android belongs to. Most of their smartphones are on Pie now, while many other OEM's, even some Android stalwarts, have yet to push it out. There are many OEM's they can learn from HMD concerning updating and supporting their smartphones. For Android One, it's pretty slow. Unfortunately, it seems that Google has dropped the ball with Android One. Thankfully, HMD applies the updates better than most. Android One or not they are pretty much stock/AOSP ROM, don't need much work with the update. Isn't Google in charge of Android One updates? Are we giving them a pass now? Android One is all empty promises, it seems. Nope, just like Xiaomi, Asus and other Android One, Google publish factory images/source and then it's up to OEM to update them on Android One, they are allowed to add customizations to certain degree, mostly only couple of minimal settings and camera app. It's different from Pixels, they are developed and updated exclusively by Google. I'm finding it hard to believe that Google doesn't push the updates themselves to Android One smartphones after reading this: https://en.m.wikipedia.org/wiki/Android_One And IF Google doesn't push the updates themselves, then how long do Android One OEM's have to wait before they receive factory images from Google? Shouldn't there at least be a stringent update schedule for Android One smartphones enforced by Google IF they don't push the updates themselves? Or is Google delaying Android One OEM's from receiving the updates in a timely manner on purpose to try and push its Pixel line? Because Android One smartphones on a whole haven't been getting updated as fast as one might think. Of course OEMs get them the same time after Google updated Pixels, or even before then. Essential PH-1 isn't even an Android One and get Pie update the same day as Pixels that means Google publish AOSP the same time as they released update. Seems like you misunderstood about Android One, they are made to bring Stock Experience to more people with the help of OEMs, they are pretty much stock or everything Google publish the OS, so OEMs don't need to work as much as they do for heavy-skinned Android so they can deliver updates much much faster, 6 months is very slow, might as well apply a heavy skin on top. OnePlus 6 isn't even an Android One get the update within 1 month or so. A Google Blog article says “Faster access to Android OS updates for two years, including the latest AI innovations from Google”. That’s from Google themselves. So if what you’re saying is the case, then Google isn’t releasing the update to Android One smartphones in a timely fashion. They should have access to the update BEFORE non-Android One OEM’s, but not one Android One OEM to my knowledge updated their Android One smartphones before some other non-Android One OEM’s. How can Google he releasing the update to all OEM’s at the same time then? Something is not right here, and it’s on the part of Google, hence them dropping the ball. Seems like you misunderstood about Android One, or Google isn’t upholding its end of the Android One promise. In relation to most other OEM’s, HMD is faster and more consistent with the updates to their fleet of smartphones. The OEM’s you mentioned (OnePlus and Essential) 4 or less smartphones to worry about updating. HMD has at least 13 to worry about updating. There is no way you can tell me that the amount of smartphones to concentrate on concerning updates doesn’t affect the speed in which it gets disseminated. I know some here will say it’s an excuse, but that’s far from him. How many other OEM’s have as many smartphones on Pie as HMD does? Google has dropped the ball with Android One, and it’s now just an empty promise. HMD's Nokia is not what Nokia used to be. More than 6 months for a stock experience is suuuuuper slow. Even chinese OEM like OnePlus is miles better. Nokia don't even have balls to drop. Lol. Please search about Android open-source nature if you still don't understand regarding updates/aosp source. HMD has been doing well by the Nokia name for just arriving in the smartphone business a little over 2 years ago, and they've updated their smartphones quicker and better than most. Of course they aren't like the Nokia of old, because of how new they are. That's common sense. "Nokia" isn't even involved in the smartphone space anymore. Please reread the info I posted. I don't think you grasp the fact that Google made the promise of Android One OEM's having access to updates sooner than non-Android One OEM's, and they've dropped the ball on that so hard that the air was knocked out of it, lol. Also, HMD is within the top 5 Android OEM's for updating their smartphones. When they are beating so many other OEM's to the punch with updates, how can you say it's "pretty slow" for Android One, especially when your comment points to Android One not being a factor since you say it's up to the OEM. Exactly. It's just stock Android. It's not like it's a custom UI like Samsung. But Nokia has also been late before with security updates. The blame lies on them and not Google. You're right. It is stock Android and not a custom UI. So why is Google not pushing the Android One updates out in a timely manner? You're giving Google a pass and making excuses for them. I agree. Nokia dropped the ball with Android One since the update has already been applied to the Moto X4. Google didn't drop anything despite the false pretense. HMD released Pie on the Nokia 7 Plus before the Moto X4, iirc. So using the X4 as a basis for HMD "dropping the ball" is a false pretense. Google has dropped the ball with Android One. Where is the stringent update schedule? Shouldn't Android One smartphones be getting the updates right after the Pixel line? What is the benefit of having Android One if Google can't enforce a better update policy for Android One smartphones? It seems like Android One has been reduced to nothing but empty promises from Google. How is Google dropping the ball for something Nokia is responsible for doing? See you're backtracking and changing your tune. The update is already available for Nokia to push it out. You just want to make excuses for them. Because Google is responsible for pushing out Android One updates. How am I backtracking or changing my tune when I'm saying the same thing I've been saying here? Stop deflecting and making up stories to suit your false narrative. You're making excuses for Google and giving them a pass for dropping the ball on something that they are supposed to be in control of.